There are many financial and legal benefits to explore. The math is obvious. Two incomes add up a lot faster than one. But marriage also affects your finances in many other ways, including your ability to plan for retirement, plan your estate, and capitalize on tax and insurance-related benefits. If both you and your spouse are working, you can double up on employer-sponsored 401(K) contributions. Two salaries also make home ownership more affordable, making it easier to save and plan for investments. Most pension plans provide benefits to survivors in the event of the pensioner's death. Qualifying spouses may also collect Social Security benefits up to a maximum of 50% of the benefit earned by a deceased spouse. Couples who wish to structure their estates so that each spouse is the sole beneficiary of the other need to create wills to ensure that their wishes are realized. In the absence of a will, state laws governing disposition of an estate take effect. Also, certain types of trusts, such as QTIP trusts and marital deduction trusts, are restricted to married couples. When filing federal income taxes, filing jointly typically results in lower tax payments when compared with filing separately. 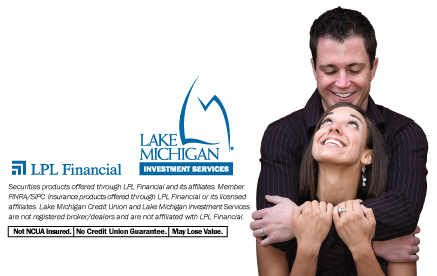 Contact LMIS for a complete and free financial review at (616) 234-6524, or go online to lmcu.org/investments, to make sure you’re taking advantage of all possible benefits.